Loosen your grip and let yourself relax. You’ve been overdoing it. Stop burning the candle at both ends and take a break, or your health, work, and relationships will suffer. If fear is driving you, it is time to trust that the Universe is not going to fall apart if you take time off. Your needs will be met. You are going to be okay. Take a long, deep breath and start resting NOW. If this card appears upside-down, you may have insomnia issues. You’re trying to get enough rest and sleep, but your mind and body are not cooperating. If medicine or herbs aren’t working, try meditation where you slow down your breath and keep your eyes from moving. Look to the other cards in your spread or shuffle and draw a new one for additional support. You are invited to share your spread with other mystics, seekers, and Transformation Oracle readers! This safe, private group on Facebook gives you a forum to take a photo of your spread and upload it. 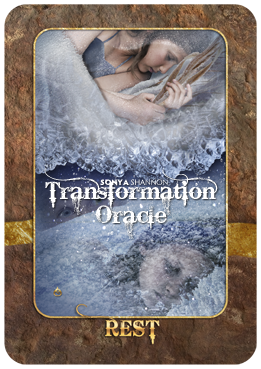 Browse the Transformation Oracle group on Facebook to see how others have interpreted spreads.